Ischemic tachycardia - what it is. Ischemic tachycardia in adults and children, the heart rate on the ECG. Among the various clinical signs of the rapid heart palpation, ischemic tachycardia occupies a special place. What is it and how this violation of the rhythm manifests itself can be found in the following thematic article. Ischemic tachycardia is a rapid heartbeat that has led to the development of coronary heart disease. A similar disease is common enough, mostly in the elderly, when the heart muscle begins to respond to age-related changes. The use of the term "ischemic tachycardia" is common among cardiologists, since it can be used to immediately mark the consequences of the tachycardia. Electrocardiography is obligatory during diagnosis of the pathological condition and, depending on the indications, other research methods, such as Holter monitoring or electrophysiological diagnosis, may be used. In some cases, tachycardia may become the cause of coronary heart disease. Then they say about ischemic tachycardia, which is diagnosed among patients with IBS relatively often. IBS is a cardiac disease, the presence of which indicates a mismatch with the consumption of oxygen by cardiomyocytes to its delivery. 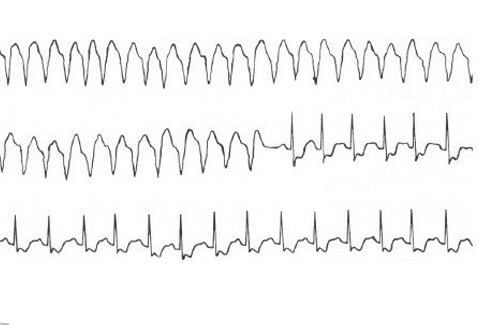 To "correct" a similar situation, the compensatory mechanism in the form of a tachycardia is started. What could be a dangerous ischemic tachycardia? First and foremost, the development of a number of complications, among which the most unfavorable is the ventricular fibrillation. This pathology is considered life-threatening, as it can lead to a cardiac arrest. Due to a number of reasons, tachycardia develops and in connection with an increase in heart rate, the consumption of oxygen from the heart muscle increases. Coronary blood flow is disturbed due to increased vascular resistance in cardiomyocytes and associated with this decrease in blood circulation. In parallel, the diameter of the diastolic system decreases, which contributes to insufficient ventilation of the ventricles with blood. As a result, inadequate blood volume enters the general circulation system. Thus, the appearance of tachycardia in a number of cases can provoke the development of coronary heart disease, which is quite difficult to be tolerated by patients in view of organic heart disease. At the same time, various organic heart diseases, especially myocardial infarction, can provoke the development of tachycardia, as during the damage to the heart muscle its basic functions (excitement, conduction, automatism) are violated, as a result of which ectopic foci are formed, which additionally generates impulses and thereby increasing the frequency of heart rate. The pathology appears to be standard for tachycardia symptoms: sensation of palpitation, possibly the appearance of tinnitus or the feeling of "jumping out of the heart from the chest". Very sensitive people are often observed vegetative disorders, manifested in the form of weakness, sensation of heat, cold limbs, pallor of the skin. The latter symptom is especially common in long-running tachycardia. The first symptoms of the pathology often occur during physical activity, with the age of patients is 50 years or more. Since tachycardia is closely related to myocardial ischaemia, pain often occurs in the area of the heart, which indicates the progression of the ischemic process. Painful sensations can be of varying intensity and are often perceived as compressing, burning, compressing sensations that can pass through nerve fibers to other parts of the body, located on the left side (arm, lower jaw, back, shoulder). The development of the heartbeat that provokes further ischemia may be due to various causes. In the elderly, as a rule, there is a frequent emotional or physical stress that is inconsistent with age. In younger people, the pathology develops less often, and it is often not possible to establish a reliable cause for its occurrence. Causes of tachycardia, which appeared in the context of IHD, are often associated with organic heart disease (myocarditis, coronary artery atherosclerosis, small scrotal arteries, "dense" blood). With the last risk factor, it's not so easy, because cardiac activity is detrimental to both intense physical work and its lack.In this question it is extremely important to observe the golden mean. There are many different forms of tachycardia, but in the development of myocardial ischemia, sinus tachycardia and ventricular tachycardia are most commonly encountered. The first is prognostically more favorable, since the latter can cause ventricular fibrillation. It is more often associated with that mechanism of development of a pathology, which is expressed in the initial appearance of tachycardia, and then on its background occurs ischemia. Such interdependence is often observed in frequent emotional and physical stresses, when a person first senses a tachycardia only at the moment of overvoltage, and in the future it begins to disturb him in a calm condition and is accompanied by other symptoms characteristic of ischemia. During sinus tachycardia, heart rate increases relatively low - in adults it can be 100-150 beats per minute. Such a heartbeat is initially not felt at all and does not disturb, therefore, most patients with a so-called ischemic sinus tachycardia turn to the doctor when it appears in a state of rest. Depending on the location of ectopic foci, the left ventricular and right ventricular ischemic tachycardia are isolated, is this pathological hazard dangerous? In most cases, yes, since it is considered prognostically unfavorable disease, to a large extent disturbing cardiac activity. The onset of ischemic ventricular tachycardia is accompanied by an increase in heart rate to 140-200 beats per minute.Moreover, their appearance is often associated with a newly developed myocardial infarction, often in the first two days.Recurrence of arrhythmia in such cases is rare. With ischemic sinus tachycardia, the correct, regular rhythm is observed, with a heart rate of 100-150 beats per minute. Ventricular complexes are not deformed or expanded. With ischemic ventricular tachycardia, heart rate is 130-200 beats per minute. There are clear changes in the ventricular complexes, especially after myocardial infarction. In this case, QRS is expanded, deformed, the configuration of the tooth resembles the blockade of the left leg of the bundle of Gissa. In rare cases, additional analyzes and studies are needed to clarify the diagnosis. If necessary, ultrasound of the heart, electrophysiological examination, Holter monitoring. All patients with ischemic tachycardia should first of all correctly regulate their physical activity. If you do not have enough of it, you need to start a suitable sport. At frequent physical activity, it should be reduced in order not to force the cardiac muscle to experience oxygen starvation. Symptomatic treatment of ischemic tachycardia is to prescribe antiarrhythmic drugs. These may include beta-blockers, calcium antagonists, and if-inhibitors. The last group of arrhythmics for today represents only a preparation - Koraksan. Video How to train after a heart attack or heart disease? Prevention of ischemic tachycardia is not specific, that is, the same as with other cardiovascular diseases. First of all, medications are prescribed that help prevent the following attacks. Often it is antiarrhythmic. Supplemented dietary nutrition and therapeutic physical training.